Today's post will be short as it is a holiday weekend up here in Canada. To my old friends in Northern Quebec I recall today is summer with the Fall starting tomorrow. It's cold up there and the black flies are bigger than small dogs. As we approach the first important date in August, Aug 7th, I am still out of stocks but holding Gold and Silver. Aug 7th is the geocentric Jupiter opposition Pluto aspect which is approx. 13 years in length. Normally I would put a wider range on such a long-term aspect but in this case just +- 3 td's. Not looking for a crash but a turn down for general equities. Remember this is the start of the Jupiter translation of the Uranus / Pluto square. 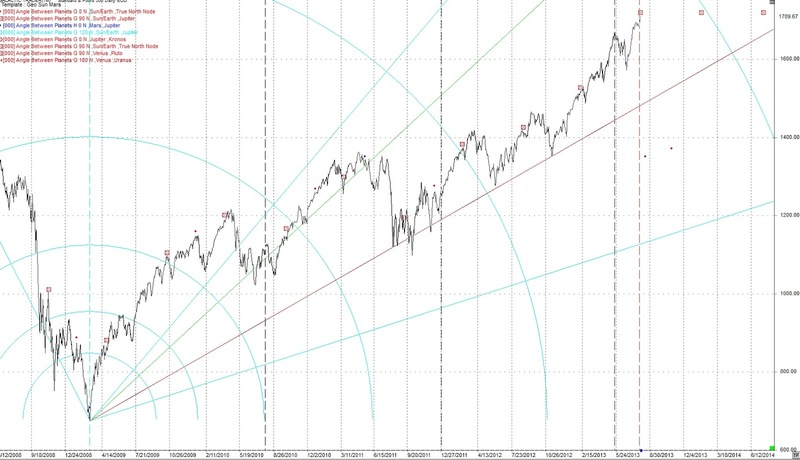 And one for interest sake.The high before the March 6, 2009 low was Oct 11, 2007. That's 512 cd's (calendar days). 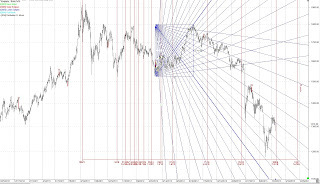 512 * pi(3.14159) = 1608. 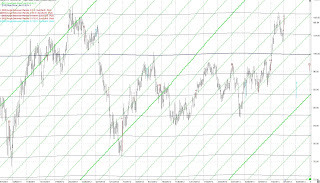 Also note the red fan line is .618 and has acted as support as the market has moved up. We are well above that line now. 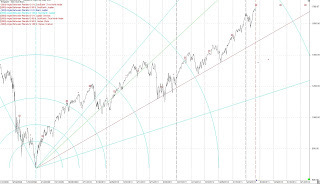 The black vertical lines are successive 512 cd's from March 6, 2009 and the fib arcs are unnecessary. From the last post we've seen the "quick move lower" and now looking for a move up in precious metals. 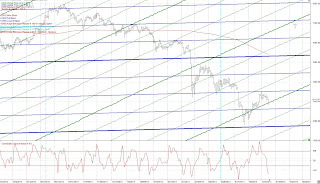 The following daily chart see's Gold on the Venus price line. I'm looking at this as support and we either follow the Venus price line up or it bounces off this price line and we get a sharp move up. 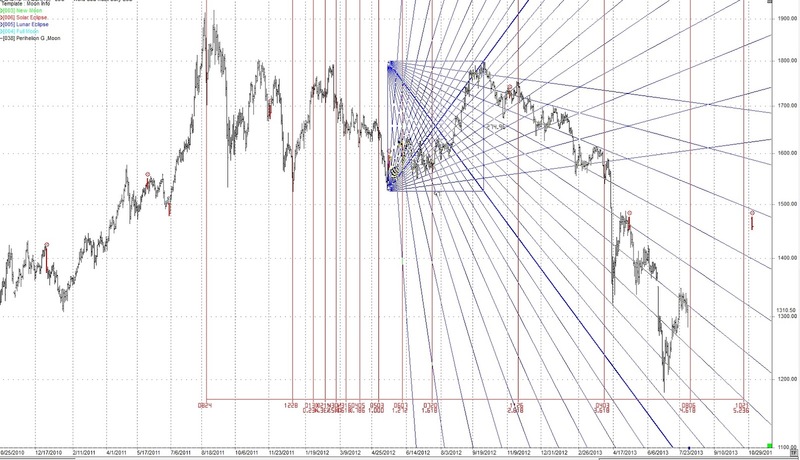 The next chart shows fib time ratios and fib fan lines pointing to a move in Gold around Aug 6. Crude unexpectedly bounced this week, at least unexpected by me. 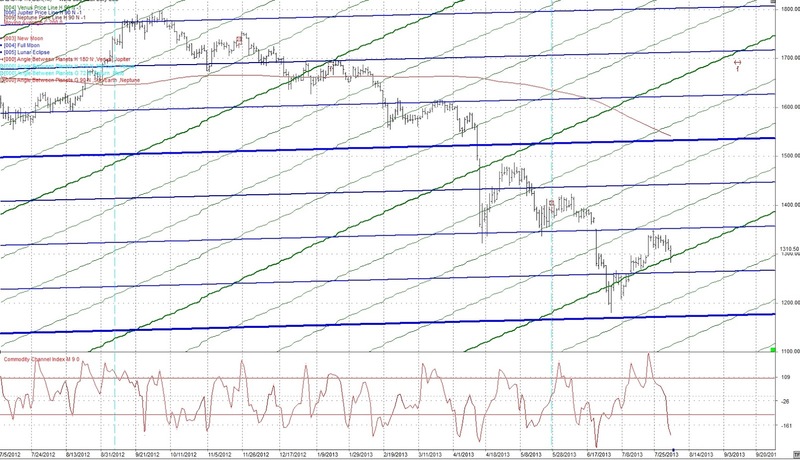 The following chart shows the 45 degree Sun / Pluto price lines which have acted as resistance. 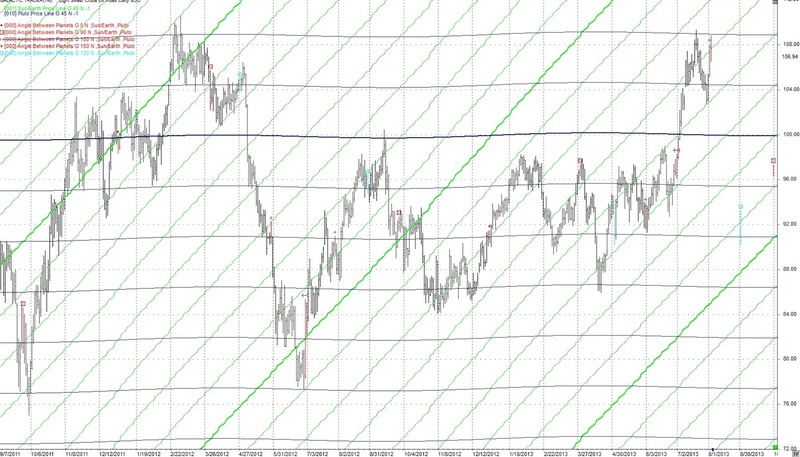 A pull back to the Sun price line (green) or Pluto price line (black) is expected this week. As this is the 16th week of the primary cycle I expect crude to move lower after this week as well.